The cool colours of this beach bag will make you yearn to spend a holiday at the seaside! 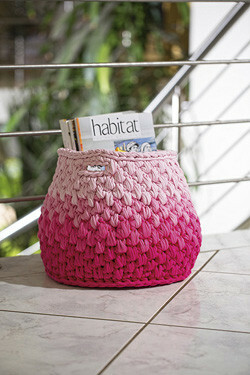 Add a sturdy base and a fabric lining, and you can use the bag just about everywhere. The finished bag is approximately 34cm high and 49cm wide. Slip stitch has always been viewed as a way to join rounds – a functional rather than decorative stitch. In this pattern, the humble slip stitch takes centre stage, and an interesting texture is achieved by simply alternating the stitch between the front loop and the back loop. Getting used to slip-stitch projects requires a little practise, but don’t despair! You will soon develop your own technique and the result will definitely be rewarding. The completed cushion measures approximately 45cm in diameter, with a height of about 32cm. 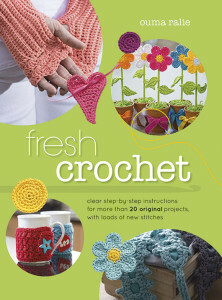 This project is really easy and can be completed in a jiffy because it is crocheted with a thick, chunky yarn. It is a very practical scarf for the man in your life who doesn’t like the idea of a traditional scarf with flapping ends that always get in the way. The finished scarf measures approximately 84cm x 22cm. 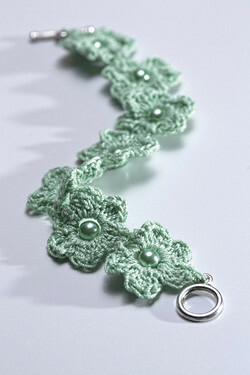 This little bracelet looks very impressive, but is actually quick and easy to make. 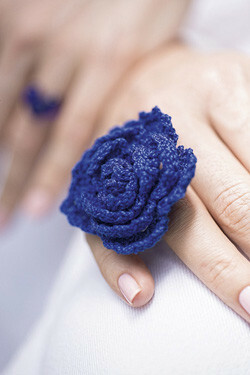 Make it as a gift for a special friend in a colour that she loves, and she will always think of you when she wears it! This bracelet is approximately 16cm long. 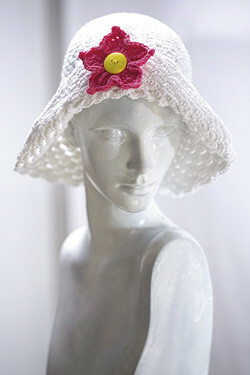 You can make it longer or shorter simply by crocheting more or fewer flowers. Crocheted or knitted cotton dishcloths have been popular in America for quite some time. The cotton absorbs moisture well, so these cloths can be used very effectively in the kitchen or as all-purpose cleaning cloths. 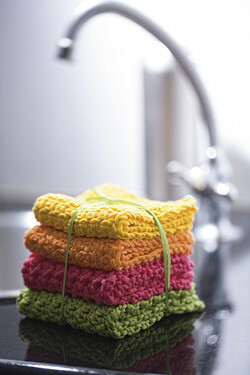 Because of the size of the washcloth, this project is ideal when practising a new stitch; and you can use it afterwards! The finished dishcloth is a 19.5cm square. 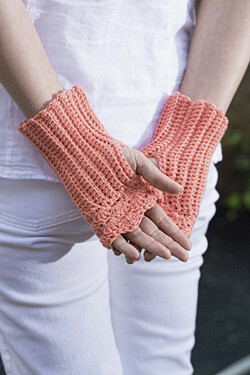 These mittens are ideal for those cold, wintery days where you need a little extra warmth for your hands, but still have to use your fingers (like texting!). 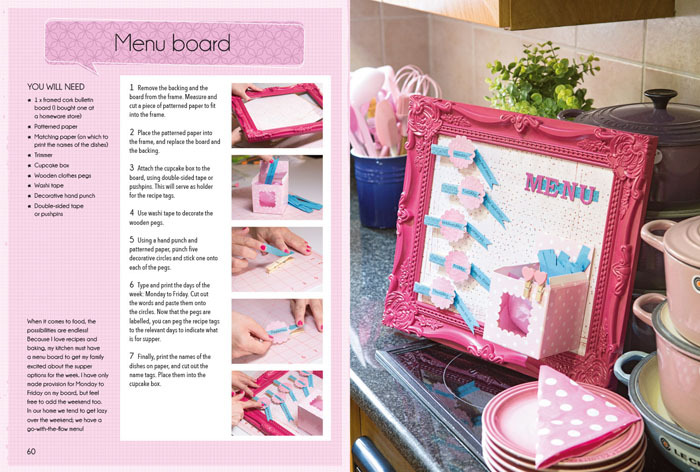 They are super-easy to make and will make great gifts too. This hat is sure to match not only your mood but also your outfit! Crochet flowers in assorted colours, using leftover yarn from previous projects, and vary them to create a brand-new look. You can turn down the brim if you are in the mood for something different. The finished hat measures approximately 28cm in length from the crown to the brim, and should fit an adult. 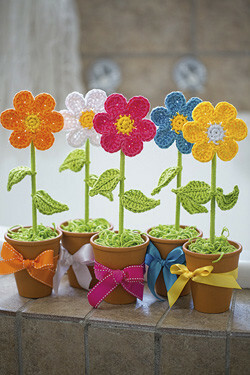 Make sure you have flowers in the home throughout the year – crocheted flowers will never wilt! 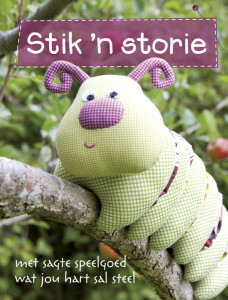 They make ideal gifts and instantly create a cheerful mood in a child’s room, or even an office. The flowers are approximately 9cm in diameter and the leaves are about 6cm long. 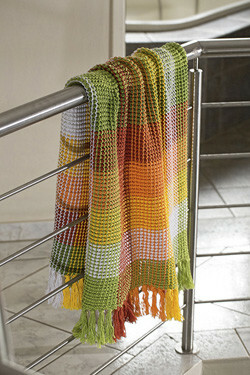 This blanket is first crocheted in broad coloured stripes, and lines of slip stitches are later worked vertically across the stripes (surface crochet) to create the blocks. The front- and back-post stitches provide an interesting texture, and the effect is so beautiful, it hardly requires surface crochet (the texture runs vertically on one side of the blanket and horizontally on the other side). You can also use four instead of six colours (in which case you will need to buy 4 x 100g balls of each colour). If you prefer to use only three colours, you will need 5 x 100g balls of each. The completed blanket measures approximately 115cm x 105cm. 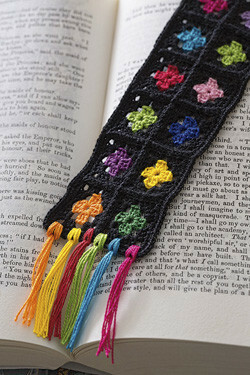 Make this trendy granny-square bookmark for someone who loves reading. 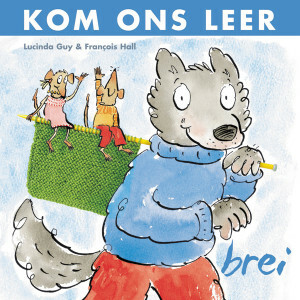 What is more enjoyable than reading in front of the fireplace during those winter months? 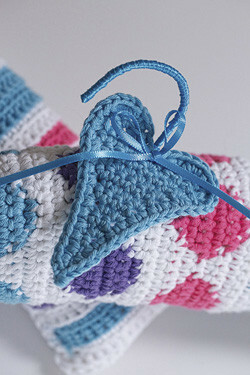 You can even crochet a matching blanket in the same colours as an extra special gift! The completed bookmark measures 16cm x 5.5cm. Crochet hearts in colours that match your festive theme and hang them on the Christmas tree, or use them to embellish gifts. 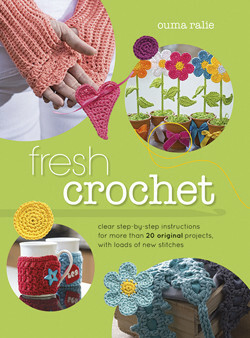 Vary the weight of the yarn and the size of your crochet hook to make hearts of various sizes. I used these hearts to embellish the padded hangers. Making little crochet hearts is the ideal way to use up leftover yarn from previous projects. The finished heart is 11cm high and 7.5cm wide. Make a whole string of hearts for your daughter and decorate the headband with bright buttons, or omit the buttons if she prefers the plain hearts. The completed headband is approximately 67cm long (the section with hearts measures about 40cm) and 4.5cm wide. Change the length of the midsection by adding more or fewer hearts. 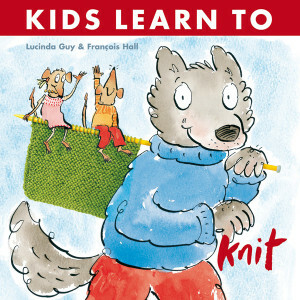 Imitating knitting stitches has recently become a crochet trend. 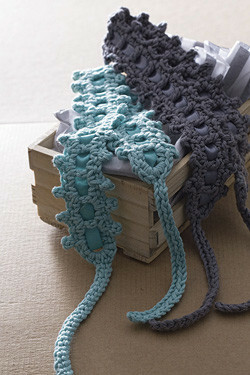 A simple double crochet is adapted slightly and the result resembles a knitted stocking stitch. 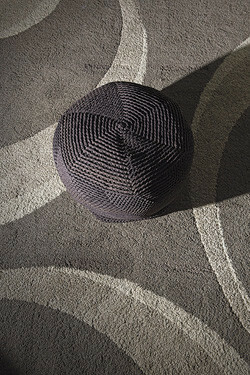 T-yarn is used to emphasise the striking simplicity of the pattern. If you don’t like working with t-yarn, feel free to use any other thick yarn and combine several strands to achieve the thickness of the t-yarn. 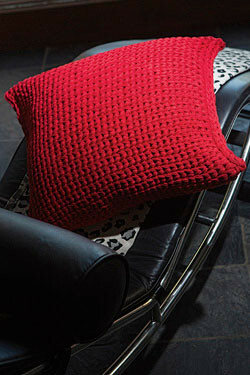 The completed cushion is a 46cm square. 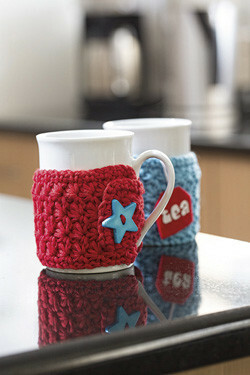 Use this bright mug cosy to keep your coffee or tea nice and warm. It is also a good way to “mark” your mug, preventing others from accidentally drinking your coffee! The cosy is crocheted so quickly, you can even make a few extras as gifts for friends or colleagues. You can personalize the gift by adding their initials. It fits a mug of about 22 to 24cm in diameter. The completed cosy is 22cm long excluding the flap, or 28cm including the flap, and it is 8cm high. 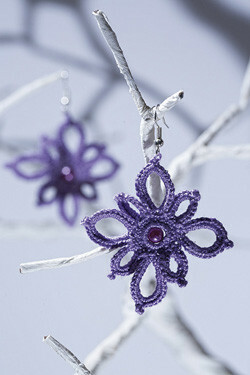 These earrings were inspired by tatting (knotted lace), which demonstrates the versatility of crochet in that it imitates so many other handcraft techniques! This project is actually easy but, because of the thin yarn and fine crochet hook, it requires skill with the basic stitches used here. Chain stitches should be smooth and of even size in order to achieve a symmetrical finish. The finished earrings measure approximately 5cm x 5cm. Simply adding one or two focal points to a room can make a stunning change to its overall appearance. This reversible cushion allows you to achieve this twice, without blowing your budget! Use the cabled side for a natural feel with a touch of texture, or turn the cushion around if you want to add more colour to the natural palette. 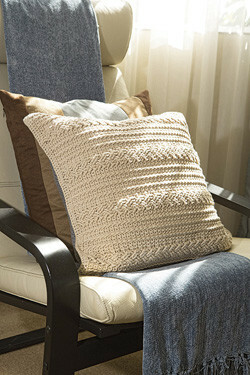 Beginners can keep the pattern on both sides of the cushion the same by crocheting the striped side twice. Use the same colours, but vary them so that the two sides differ; or use completely different colours on one side if you want to achieve a totally new look. The finished cushion is a 46cm square. 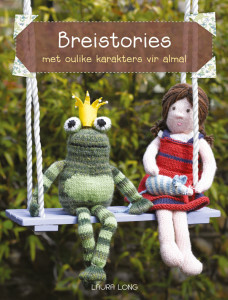 This project is ideal for beginners who are comfortable with double and treble crochet. You will master the picot easily and, in a jiffy, you will have a brand-new headband to show off! Crochet a few in a variety of colours. The completed headband is approximately 68cm long. 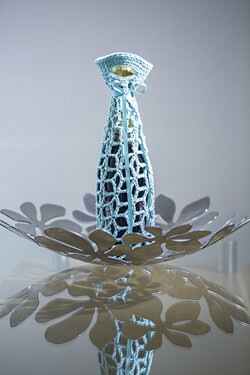 A crocheted rose differs from other crocheted flowers in that it is crocheted in rows and rolled up afterwards to resemble a rose. Increasing the stitches in every row creates curls and frills, and the crocheted piece starts to resemble a spiral, which makes it easy to roll up the rose. The finished rose is approximately 4cm wide and 2cm high. 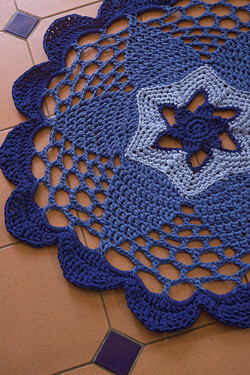 The colours used to crochet the various sections of this mat highlight the different flowers and stars of the pattern. Combine bright colours to liven up a child’s room – for example, yellow, green and pink, or orange, yellow and pink. Neutral colours, such as various shades of grey or a combination of grey and cream, can be used for a room with a more natural colour scheme. The completed mat measures approximately 1m in diameter. 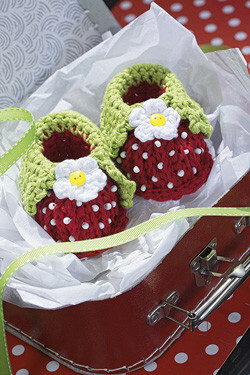 Use these adorable baby booties as décor in your baby’s room, or crochet them as a gift for the next stork party. You won’t need a lot of yarn, and the booties can probably be made of leftover yarn from previous projects. The sole is approximately 9cm long. 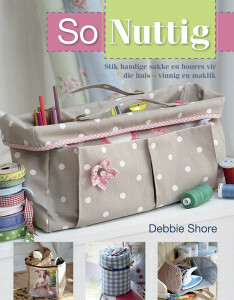 Use this versatile basket to store toys, for your crochet yarn, as a portable laundry basket, or to keep your favourite magazines handy. Use a single colour for a more classic finish, or several bright colours for a happy, playful look. You can also work the basket in double crochet only – simply replace the spike stitch with double crochet. The size of the basket will depend on the weight of the T-yarn used. Heavy yarn, or two strands of a lighter yarn, will make a basket with a base of about 38cm in diameter, approximately 30cm high. 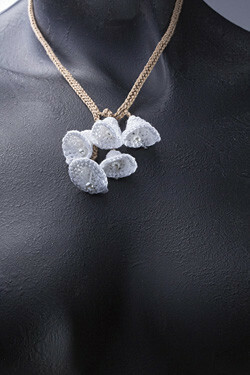 Crochet delicate, miniature lilies for this extraordinary lariate. 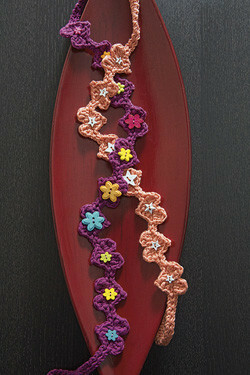 The lilies are individually sewn onto a fine, branching chain that is also crocheted. The lilies meet in the front where they are folded over one another. Having a little experience in working in rounds is advisable, since working on this tiny scale makes it difficult to see exactly where to make the stitch or join the round. The finished lariate measures about 50cm from end to end. 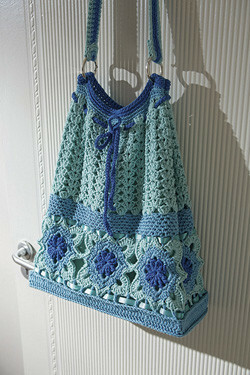 To lengthen it, simply add more chain stitches. Use this carry bag for your wine when you set off to picnic, or use it as a gift bag when you give someone a bottle of wine. The completed bag is large enough to accommodate a standard bottle of wine or champagne.